The sermon is the first and most enduring genre of American literature. The essential medium of the Puritan settlements, it continued in succeeding centuries to play a vital role - as public ritual, occasion for passion and reflection, and, not least, popular entertainment. The 58 sermons collected in this volume display the form's eloquence, intellectual rigor, and spiritual fervor. Ranging from the first New England settlements to mass-media evangelism and the civil rights movement in the 1960s, these texts reclaim a neglected aspect of American literature. The reflections on the daily gospel presented here by Segundo Galilea are simple but meaningful reflections which can be used in the Eucharist and daily meditation. 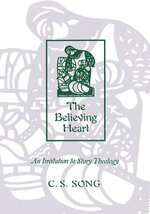 C. S. Song here invites Christians to see the whole Christian panoply through a story-centered lens. Focusing on Life, Hope, Faith, and Love, Song delves into each theme or locus (1) as it can be approached in people's experiences or stories, (2) as it appears in related stories from other religious traditions, (3) how its central import can be expressed theologically, and (4) how it can appear in practice. Thus story becomes theology, then theology becomes story. "Central to these stories," says Song, "is the heart that believes in spite of hardships and despair, the heart that struggles to make sense of what seems senseless in life and history." Song's strong narratives and engaging style will make this volume appealing in a variety of settings, especially for introductory students, clergy in search of homiletic material, church groups, and Christians open to insights from non-Western cultures. When Elizabeth Goodman first arrived at the tiny congregation that would become her home as a pastor--a congregation of about seven people in a town of just under a thousand--the longest-standing member told her that though the congregation was small, her preaching need not be. In this collection of sermons, readers will witness a mind at work amidst a faithful congregation (whose numbers are now around thirty), mutually nurtured, and together having no small amount of fun. Meanwhile, the ramifications of the gospel in the world will sneak up and surprise. Guided always by a spirit of play and by scripture, as it is in conversation with life, Goodman illuminates both the quiet suggestions that undo what we think we know and the startling demands that are to be both feared and desired. This congregation has a tagline: ""It's not what you think."" They are probably right. 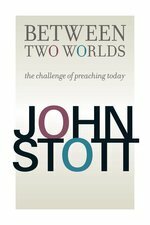 ""This is a book of thirty-three sermons for both preachers and non-preachers. Preachers will discover rich resources for their own preaching ministries. 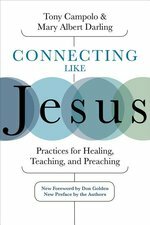 But they will also find what non-preachers are looking for--faith nurtured, hope stirred, and guidance for Christian discipleship in the midst of honest and authentic questions."" --Erskine Clarke, Editor and Publisher, Journal for Preachers ""Elizabeth Goodman has provided a gift to everyone who longs for the beauty and wonder of God to break into our lives and to transform our world. Rarely is a collection of sermons so theologically rich, offering reflections on scripture that, like the Spirit herself, take us by surprise and lead us where we never before dreamed possible."" --Phil Snider, Author, Preaching After God ""Reading this book of sermons is like having an unfailingly interesting conversation with a friend who happens to have a degree in theology. Neither shaken by questions nor satisfied by glib answers, Goodman is a treasure."" --Louisa Gilder, Author, The Age of Entanglement: When Quantum Physics Was Reborn ""I don't know Elizabeth Goodman, but her sermons make me want to know her. Perhaps more importantly, her sermons make me want to better know the God of whom she speaks. Goodman writes with an intoxicating blend of gravity and lightness."" --Anthony B. Robinson, Author, Transforming Congregational Culture and What's Theology Got To Do With It? Elizabeth Goodman has been the pastor of the United Church of Christ in Monterey, a ""hilltown"" of the Berkshire Hills in Massachusetts, since 2001. A lifelong member of the UCC and a graduate of Harvard Divinity School, she is a regular contributor to the Journal for Preachers. She lives with her husband and their two sons at the foot of October Mountain, which makes for a good daily hike with her dogs. What role does the sermon play in the life of the church? How does one preach on the basis of Scripture as canon? What aspects of preaching are crucial for a renaissance of proclamation in the community of faith today? This volume answers, by way of example, these and other questions central to the task of Christian preaching. 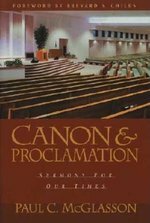 Building on Brevard Childs's theological perspective on canon, Paul McGlasson's highly original book addresses the relation of Scripture and contemporary proclamation through the week-to-week experience of preaching in a local church. The sermons included in this collection are not only gems in their own right but also illustrate a new theology of proclamation for other preachers seeking practical help in formulating sermons that bring Scripture to bear on the challenges of modern life. Henry H. Mitchell's great contribution to the study of preaching has been his insistence that the homiletical practices of the Black church are gifts to the whole church. Nowhere has he made this point more forcefully than in Celebration and Experience in Preaching. In this classic text he advocates a way of preaching that genuinely engages all aspects of the congregation's attention, especially the ability to both understand and to feel the sermon's message. In this revised edition Mitchell builds on this groundbreaking work by examining in greater depth the multiple ways in which we experience the preached word, by defining the different kinds of claim on the behavior of the hearer that biblical texts express, and by exploring various genres of sermon to discover the concrete manifestations of celebration and experience. One of America's foremost and best-loved preachers delivers here not only 44 new homilies for different occasions but also his secrets for giving an effective sermon. These methods go beyond generalizations and show how to speak meaningfully to a particular audience at a particular point in time. In traveling around the world, Burghardt says he does not "bring" the word of God there. Instead, he believes his role is to discern God's word where it already exists. The all-new homilies are for the liturgical seasons, weddings, feast days, and such miscellaneous occasions as graduations and convocations. Each is scripturally based, relates the biblical events to our own lives today, and incorporates both anecdotes and contemporary world affairs. Each is also "classic Burghardt"--a tight, logical 3-part structure that is also literary, graceful, and passionately concerned with justice. The collection includes an index to all thirteen volumes, making it ideal for clergy of all Christian denominations, for professors of homiletics, and for the many people who read Burghardt's sermons for private inspiration. This collection of more than fifty of Fred Craddock's sermons provides a glimpse of a master preacher at work. Amazingly, only one of the sermons was preached from a manuscript written in advance, as Craddock considered a sermon to be an event in the world of sound. As a result, the selections here wonderfully reflect and preserve Craddock's "voice" and engage readers with all the immediacy of the spoken word. This collection presents over fifty powerful sermons from one of the most trusted preachers today, Walter Brueggemann. 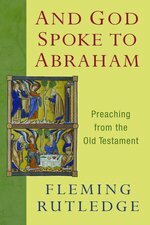 In it, Brueggemann continues his task of making the biblical text available to the church. He sees preaching as a performance of God's good rule that, in an act of utterance and receptive listening, mediates the truthful, joyous reality of that rule. The sermons are organized according to the church year, starting with sermons for Advent, Christmas, and Epiphany and followed by sermons for Lent and Easter and then Pentecost and Ordinary Time. Sermons for other occasions, such as ordinations, weddings, and graduations, are also included, along with a Scripture index. 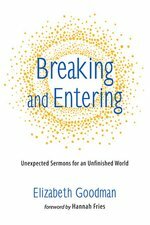 Whether a pastor or a person in the pew, the reader will find inspiration, reflection, and wisdom in Brueggemann's powerful words. Scott addresses the ten meals which Jesus shared with people that are recorded in the Bible. These occasions demonstrate the importance that Jesus placed on meeting people socially and interacting with them in their personal settings. It is in the intimacy of a shared meal that hidden emotions are often revealed -- and Scott shows how Jesus met them with searching insight, always offering his healing grace. Originally written for midweek communion services during Lent, these messages are excellent for communion services throughout the year. This unique volume draws on the wisdom of Christian thinkers and preachers from across the ages to present a warm and informative collection of insights on the art of preaching. 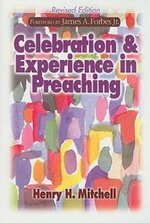 Gathering the writing of figures as diverse as Augustine, John Chrysostom, Jonathan Edwards, Gardner C. Taylor, and Barbara Brown Taylor, The Company of Preachers provides experienced advice on effective preaching, direct from the pens of those who have known it best. The book is arranged in seven divisions, each covering a central component of the preaching task. Editor Richard Lischer, himself a distinguished preacher and teacher, gives a brief introduction to each selection. Aptly presenting a theological and historical cross-section of the church's homiletics, this volume will be invaluable to preachers, students preparing for ministry, and others seeking models of powerful Christian speech. When the Baptist movement began four centuries ago, revolutionary forces had destabilized the centers of social control that had long kept women in their place. 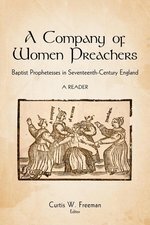 In the early seventeenth century, Baptist women began to speak their minds. Through their prophetic writings, these women came to exercise considerable influence and authority among the early churches. When Baptists became more institutionalized later in the century, the egalitarian distinction dissipated and women's voices again, for a long history, were silenced. However, long ago, in early Baptist life in England, women did preach--well and often. 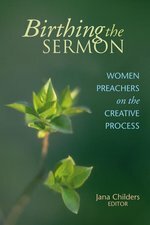 In A Company of Women Preachers, Curtis Freeman collects and presents a critical edition of these prophetic women's texts, retrieving their voices so that their messages and contributions to the tradition may once again be recognized. A hands-on resource for all Christians who want to communicate with more passion and powerTony Campolo and Mary Albert Darling have teamed up to explore the dynamic connection that occurs when spirituality/spiritual practices are combined with effective communication practices. Churches and other religious organizations depend on the ability of their leaders and members to communicate (speak, teach, and preach) within their congregations and beyond. This important, practical guide will reveal Campolo's preaching secrets and Darling's wise counsel as a professor of communication. No one has had more impact and influence on the craft of preaching in the last several decades than Fred Craddock. After his retirement from a distinguished teaching career, he became free to share his wisdom with a wider audience without the burdens of academic responsibilities. The lectures and workshops show an ever-expanding scholarship beyond that of his published books. This book has gathered the "best of the best" of these lectures/workshops and offers them to preachers and students of preaching for critical reflection and increased effectiveness. How can we proclaim justice for God's Creation in the face of global warming? How does fracking fit with "the earth and its fullness are the Lord's?" Creation-Crisis Preaching works with the premise that all of Creation, including humankind, needs to hear the Good News of Jesus' resurrection in this age in which humanity is "crucifying" Creation. Informed by years of experience as an environmental activist and minister, Leah Schade equips preachers to interpret the Bible through a "green" lens, become rooted in environmental theology, and learn how to understand their preaching context in terms of the particular political, cultural, and biotic setting of their congregation. 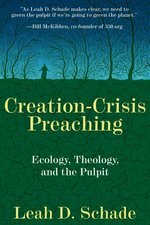 Creation-Crisis Preaching provides both theoretical grounding and practical tips for preachers to create environmental sermons that are relevant, courageous, creative, pastoral, and inspiring. In short, anecdotal chapters, the author explains how to diagnose a crisis (public, congregational, and personal) and offers six homiletical strategies for creating sermons when speaking during a crisis. The book includes: tips on how to discern a crisis; Biblical precedents for different kinds of crises; and, sample sermons in response to crises.